As another step to figuring out my constant headaches I was told to eat more protein (after having some tests done saying I was low). I was complaining also with not remember things and low energy at certain times in the day. After a week of protein smoothies I was amazing at how much better I was feeling and how much more energy I had! So here’s a post all about protein and what it can do for you and why we really need it! · Teenage boys and active men can get all the protein they need from three daily servings for a total of seven ounces. · For children age 2 to 6, most women, and some older people, the government recommends two daily servings for a total of five ounces. · For older children, teen girls, active women, and most men, the guidelines give the nod to two daily servings for a total of six ounces. The type of protein you eat may play a role in successful weight loss and in your overall health. Consumption of large quantities of processed meats such as hot dogs, sausages, and deli meats, have been linked to increased risk of type 2 diabetes, cardiovascular disease, and colorectal cancer. 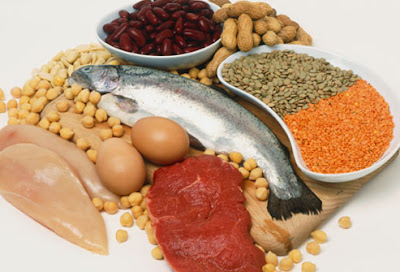 You'll have a harder time maintaining weight loss if you eat these proteins often, and you may be damaging your body. · Fish: Fish offers heart-healthy omega-3 fatty acids and, in general, less fat than meat. · Poultry: You can eliminate most of the saturated fat by removing the skin. · Beans: Beans contain more protein than any other vegetable protein. Plus, they're loaded with fiber that helps you feel full for hours. · Whole grains: A slice of whole wheat bread gives you 3 grams of protein, plus valuable fiber.